I had grand plans of having the fiber club dyed and shipped before I went to SPA last weekend, but the Fiddlehead Mitten Kit Disaster of 2008 put a damper on things. I’m almost done dyeing and things should be ready to start shipping on Monday, putting February’s club in March. Whoops. Can we blame it on the short month? Probably not. I apologize, and rest assured, your club is not lost in the mail. I just haven’t sent it yet. The fiber is glorious this month and the colorway is crazypants (in a good way), hopefully making this all very much worth the wait. The Fiddlehead Mittens pattern will be ready very soon. I’m excited to be able to offer it for sale through Ravelry. You don’t need to be member to buy through the site, but if you are, you can save the pattern in your library there, which is so handy if you lose your printed copy. I’ll keep everyone posted. It should be ready in a week or less. I’ve got SO MUCH going on lately that I haven’t had a moment to spare for blogging. It’s so sad. I did start a new knitting project at SPA. Just so this isn’t a picture-less post, that’s the swatch. If you recognize it, shhhhh. I will make a big fat post about it soon. Wow I kinda feel left out. I totally don’t know that swatch but it’s very nice. I can’t wait to see what it is. I love it when Adrian says funny things like crazypants. The delay in getting the club out is a good thing (from a certain point of view). That means we get two next month! Hooray! 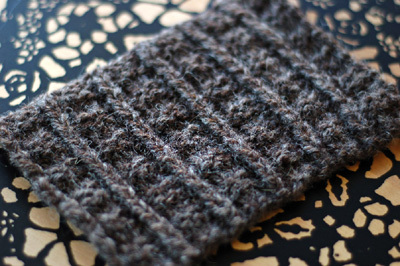 I’m so excited to hear you’ll be offering the Fiddlehead pattern through Ravelry soon! I feel like I’ve seen the stitch pattern in that swatch *somewhere* recently, but I can’t place it. Guess I’ll just have to wait til you post more about it! Adrian, I just can never wait to see what you’re going to design next! I’m super jazzed to know the pattern will be on Rav since I missed the first mitten rush! It was awesome to meet you at SPA! I’m looking forward to the Fiddlehead pattern. Thank you for your hard work on that.